My camera repair shop was somewhere down this street. Getting my camera repaired was another item on our Manila to-do list (after getting Thailand visas). Pretty soon after we arrived in the Philippines I started noticing problems with my beloved camera – a Canon Rebel XT digital SLR with a versatile Sigma 18-250mm zoom lens. Occasionally the autofocus just wouldn’t lock on a subject. The problem was inconsistent but extremely frustrating because of course those moments when I needed quick focusing are the moments it would refuse to cooperate. I had read a great post on camera repair in Manila on the Filipino Nomad’s blog before we arrived. That post suggested a repair shop, Prime Camera, in a neighborhood called Quiapo that did good work very inexpensively. There is a street there called Hidalgo that is famous for its camera shops. But because of Quiapo’s reputation for bag snatchers, pickpockets, and worse I also wanted to look into other repair options. 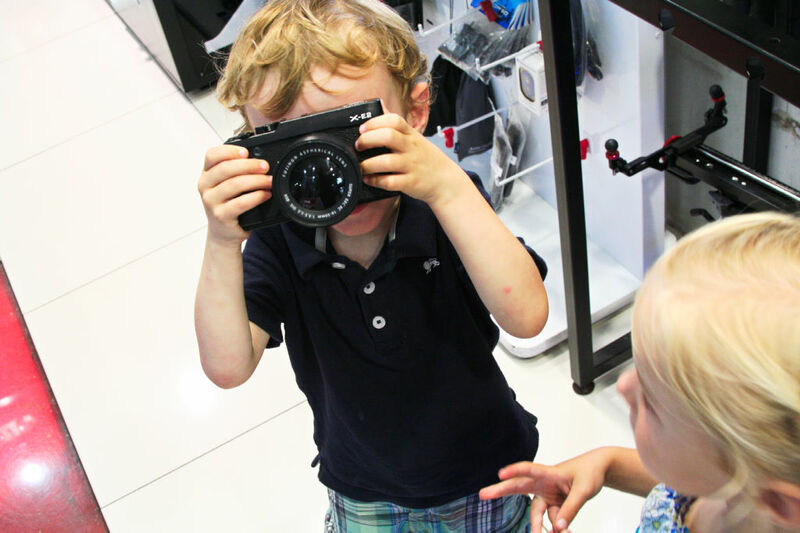 On our first couple days in Manila we stopped at probably a dozen camera stores in two different malls looking for affordable repair services. Most didn’t offer any repair services at all but we found some success at Camera Haus, which has branches at both SM Mall of Asia as well as Robinsons Place Manila (and many others). Jasper helping me at the camera store. Camera Haus doesn’t offer official repair services but staff in both stores were very helpful in diagnosing the problem. Together we tried various camera body and lens combinations, using both my gear and theirs, to figure out what the issue was. In the end we concluded that something was actually wrong with my lens, and the camera body was fine. The Camera Haus staff offered to refer me to friends that did camera equipment repair but the cost they estimated was at least 1/3 the cost of a new lens. For a lens that has been dropped, kicked, and beaten up over the course of several years I didn’t want to put in that much towards a repair even though it had served me really well. So faced with either a relatively high repair bill or buying a new lens I decided to give the shop in Quiapo a try. I scoured the comments on the Filipino Nomad’s post about cheap camera repair in Manila to see if I could get any more details about how to find Prime Camera on Hidalgo Street. Here’s a map showing the approximate location. Because of the sketchy neighborhood we decided that Kat would stay at the hotel with the twins while I went on the repair mission. I put on my plainest looking clothes, stuffed minimal cash and one credit card into a zippered pocket, hid my camera in my otherwise empty backpack and took off. I heard that the street congestion around Hidalgo made taking a cab impractical so I planned to take the light rail (LRT). Walking towards the United Nations LRT station I tried to look like I knew what I was doing. I politely dismissed the guys outside offering tricycle rides – “no thanks, all set” – and bounded up the stairs. At the ticket counter I confidently said “Carriedo” and the woman behind the glass smiled. She pointed to the other platform and said “you’re on the wrong side – you must go across the street”. Oops. The trike drivers got a good laugh when I came back down the stairs and turned to cross the street to the other platform. 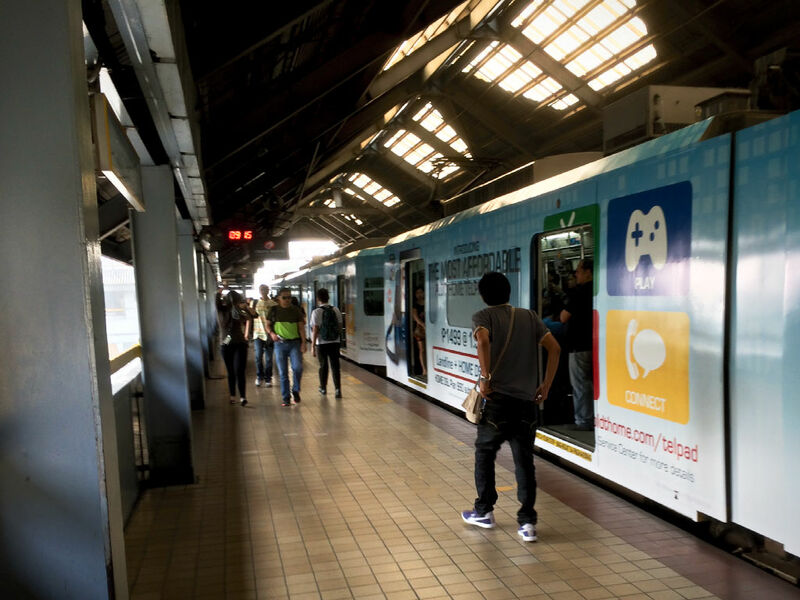 Once I actually found the right platform riding the LRT to Carriedo was easy. Exiting the station I still felt pretty good. The streets were a little dirtier and there were more homeless folks around but otherwise it didn’t seem much different than where I got on the train. But I did see several other passengers switching their backpacks from the back to the front, so I did likewise. As I turned down a side street towards Hidalgo things started to change. The “streets” quickly turned into markets with stalls lining both sides and more carts in the middle (these show up as grey on the Google map, rather than white). There were people everywhere. Loud music played from several of the stalls selling bootleg DVDs and smells of food wafted through the air. There was no way a car could pass most of these streets and it was very easy to get disoriented. I found Primed Camera behind some of the stalls and dropped my camera off. While I waited for the technician to make his diagnosis I took off and explored more of the area. Wandering in and out of the various camera stores I also got to see the huge variety of goods for sale from the stalls along the road. Fruits, vegetables, toys, clothing, flowers, and household items were all on sale. Everything is incredibly congested and chaotic. But at the same time it was vibrant and exciting. 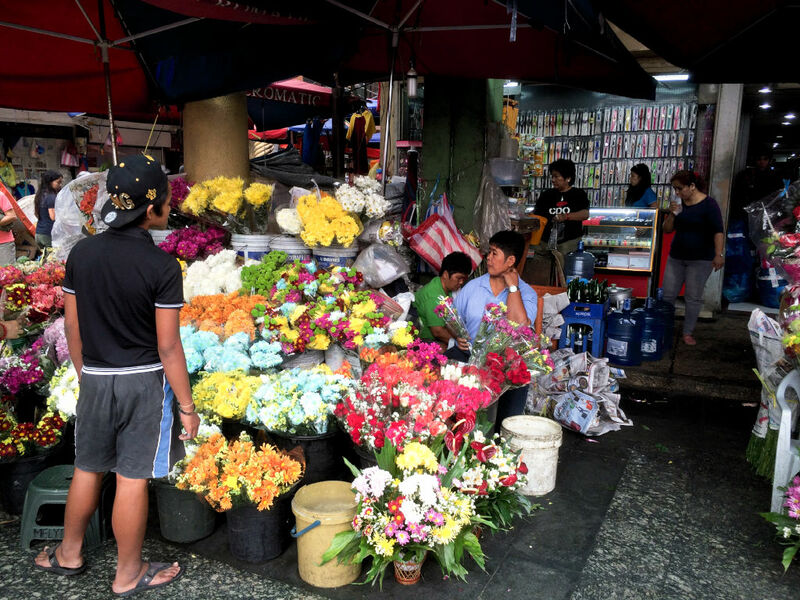 Flower stand near Plaza Miranda at the end of Hidalgo Street. I found my way to the far end of Hidalgo which spilled out onto a large square called Plaza Miranda in front of Quiapo Church. Inside this beautiful church a blessing of some kind was being performed as the priest shook holy water over a crowd of patrons. 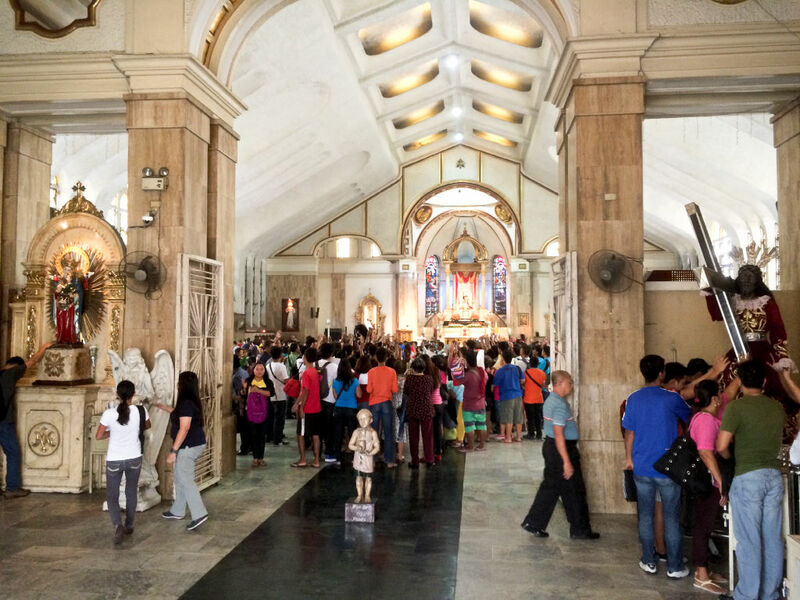 A blessing inside Quiapo Church. The technician texted me after about an hour and a half when he was done inspecting the lens, so I went back to the shop. The news was not good. The lens had a serious problem with the focusing motor. It was beyond his capacity to repair with the parts he had on hand and he recommended I seek help from the manufacturer. So packed up my camera and lens and headed back to Ermita. The ride back on the LRT was not much fun as the car was completely jammed with people. I had to physically push to get on and off, and was completely surrounded and compressed as I stood near the middle of the car for the whole ride. After a lot of effort there was no success as far as repairing my camera. I left Manila with a still-broken lens. Luckily Kat’s parents were coming to visit soon so I ordered up a new lens on Amazon (oh I miss Amazon) for them to bring along. I’m trying out the Canon 55-250mm this time – I’ll let you know how it goes. On the plus side I got to see a part of Manila that I never would have gone to otherwise. Seeing the maze of stalls and sea of people meandering through them along Hidalgo and the surrounding streets was a unique experience. It was loud and colorful and an exciting insight into life in that part of Manila. 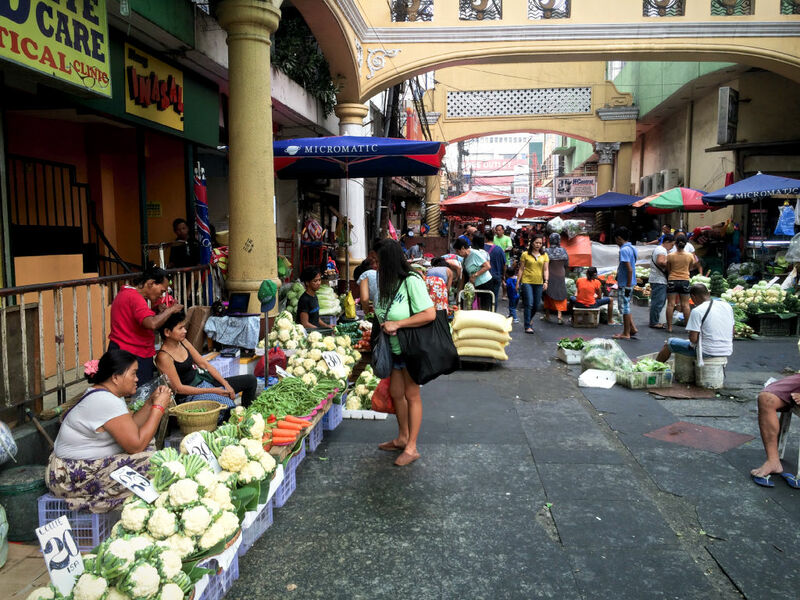 Hidalgo was less than a 10 minute train ride from our Ermita hotel but it felt like an entirely different city. 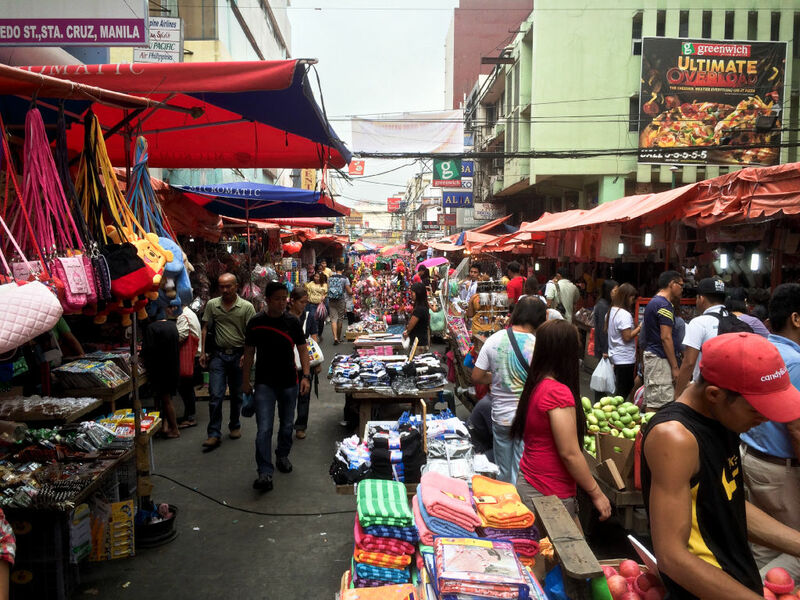 For all the worry about safety in Quiapo it was never an issue for me. Granted, I went during the middle of the day, which I think was important. I took precautions like putting valuables in zipped pockets and wearing my backpack in front of me like I saw many others in the area doing. But I never felt unsafe and I returned to the hotel with everything I left with. I wouldn’t have wanted to bring the kids over there though. The main reason is I had to focus a lot on where I was going and staying aware of my surroundings. 3 year olds aren’t the best at allowing parents to focus on their surroundings so this was one activity that I’m glad we didn’t do as a family. Visiting Manila? Find a great place to stay on Agoda. Interested in other Philippines destinations? Read our posts on Boracay, Bohol, and Palawan – or just peruse our whole library of posts about the Philippines. Glad that you are OK after this adventure! Hi Ilana! Yes, perfectly fine. It really was fun actually and I’m glad I got the chance to see that part of the city.